Goodness me…are you in for a treat! I’ve decided to start a little Christmas tradition here on the blog – every year I will be doing a Christmas themed series called ’12 Days Of LUSHmas’. I’m sure everyone knows what ’12 Days Of Christmas’ is about and although this series will start and end during the month of November each year (not December as the proper tradition calls for), I still thought it would be a cute idea. Fortunately LUSH releases a couple of new limited edition Christmas collection products each year, so I’m pretty sure I’ll always have something to feature. I actually bought more than 12 Christmas collection items while we were on holiday & had to think long and hard which products I wanted to feature this year. So here’s how it’s going to work: For the next 12 days I’ll be doing a review on 1 LUSH Christmas collection item each day (even on Saturdays & Sundays!). I thought this would be a lot more fun than doing a LUSH haul video, I ran this idea past my mama & Neal (my darling husband) and both agreed. I’m starting the series today to give you a chance to purchase the products, before everything is sold out online / in-store. Don’t worry: I will still be doing my normal every-other-day blogging for the next 12 days too, so there will be days when I blog twice in one day i.e. one ’12 Days Of LUSHmas’ review post and one other FOTD / Beauty Snoop etc. blog post. 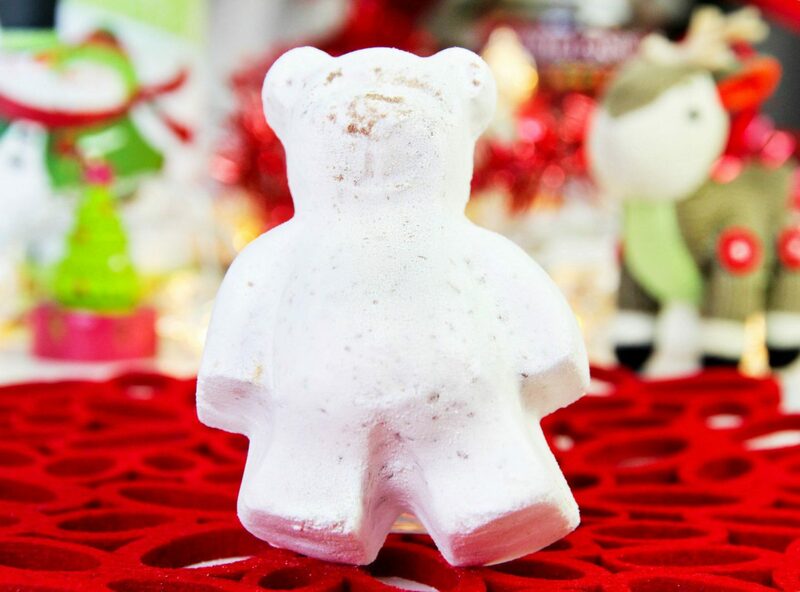 Butterbear is one of the smallest bath bombs LUSH has ever released, and is just a tiny bit smaller than Butterball. Packed with organic cocoa butter, musk, Ylang Ylang oil and sprinkled with cocoa powder Butterbear softens your bath water & fills the bathroom with a rich fragrance that is the perfect mix between sweet (vanilla) and floral (Ylang Ylang). When Butterbear hits the water, he immediately starts to fizz and releases a stream of white foam that disperses throughout the bath water. Little beads of cocoa butter melt into the water and float on top of the water to moisturise and nourish the skin. As mentioned before, Butterball is one of my favourite LUSH bath products because my skin feels super soft and supple after using it (and the same goes for Butterbear). Slap on a face mask, light a candle and sit back in an indulgent bath using Butterbear. He might not make your bath an exciting colour or very bubbly but he’s a very special little guy nonetheless! Butterbear retails for R45,00 and is currently available in the LUSH online store, as well as in-store (Menlyn, Cresta, Rosebank, Dainfern Square, Cavendish, V&A Waterfront, Canal Walk and Gateway). What a cute little guy! didn’t spot him when I got there. I am SO happy to hear that, Simone! That mask is amazing for problematic skin!! Got to love lush products they smell amazing ! Such a brilliant concept!!! Looking forward to following Lushmas. I’m so excited to see more Lush products on the blog. I haven’t used it but so far I’ve only heard good things about the brand. And I’m excited to take a LUSH bath / shower every single day for the next 10+ days! 😀 If you can get your hands on any LUSH products, doooo eeeeeet! Everyone needs at least one LUSH product in their life!! This is why I love your blog so much..so innovative! A lovely original idea to have 12 days of Lushmas!